Mission Viejo, California The gourmet jerky market share is an explosive artisanal new niche in the snack industry, recently predicted by Forbes Magazine to be the next big food trend. One small Southern California company is leading the way with more multiple awards than any other beef jerky company. Jeff’s Famous Jerky started humbly in 2010 with only a $2000 initial investment and it has expanded quickly with an army of independent distributors in more than 30 states. Jeff’s Famous Jerky recipes originated when founder, Jeff Richards began experimenting with jerky recipes in the early seventies. Some of the original recipes were fine-tuned for over 30 years. In 2010, after three years of working on all aspects of the concept, Richards teamed up with long-time friend and business colleague, Mike Aggarwal to launch the company and they soon opened a corporate office in Mission Viejo, California. Eight flavors of award-winning gourmet beef jerky is offered including Old Fashioned Original, Sweet Teriyaki, Black Pepper and Sea Salt, Jalapeno Carne Asada, Cranberry Jalapeno, Cajun Style, Orange-A-Peel and Habanero Heatwave. The perfect, healthy snack alternative, each bag of their jerky contains 30 grams of high quality protein that is 97% fat free with no added MSG or Sodium Nitrates. Purchase Jeff’s Famous Jerky on their company website; JeffsFamousJerky.com, on SamsClub.com and at a growing number of retailers across America including some branches of 7-11, AM/PM, CVS, Walgreen’s and many more. 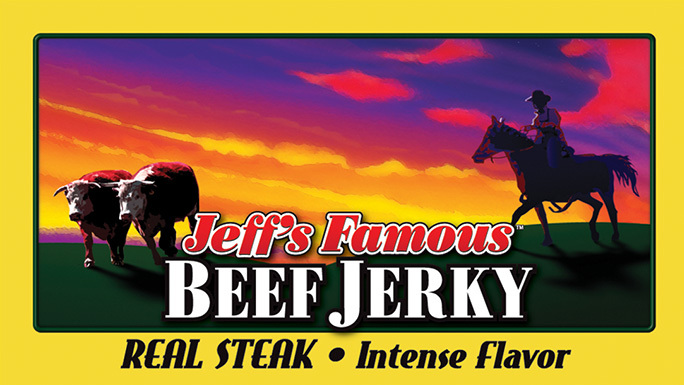 For information on becoming an independent distributor to retail stores or vending their jerky at events, contact Jeff’s Famous through their website.